premier concert de l'année ! 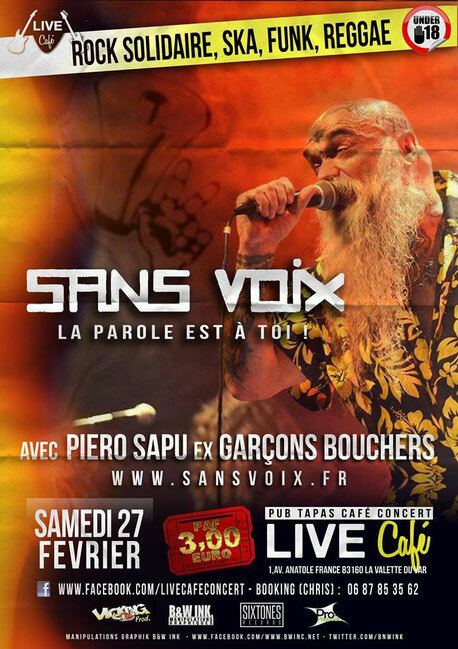 - SANS VOIX - Le rock, porte parole des exclus ! premier concert de l'année ! la 1ère date de 2016 vient de tomber : samedi 27 février à La Valette du Var ! toutes les infos dans notre rubrique concerts ! This piece of writing will help the internet users for building up new weblog or even a blog from start to end. Thank you for another informative web site. Where else may just I get that kind of information written in such a perfect means? I've a mission that I am just now operating on, and I have been at the look out for such info. Hi there! I understand this is kind of off-topic however I needed to ask. Does running a well-established website like yours take a massive amount work? I'm brand new to writing a blog but I do write in my diary everyday. I'd like to start a blog so I can easily share my personal experience and views online. Please let me know if you have any kind of suggestions or tips for brand new aspiring blog owners. Appreciate it! It is appropriate time to make some plans for the future and it's time to be happy. I have read this post and if I could I desire to suggest you few interesting things or suggestions. Perhaps you could write next articles referring to this article. I want to read more things about it!